Back last month news of a successor to the Samsung Galaxy Nexus surfaced delivering a few specifications on the handset, that is known as the Samsung Galaxy Premier GT-i9260, also know as the Galaxy Nexus 2, and today we have an image that is said to be of the Android 4.1 touting Galaxy Nexus 2. 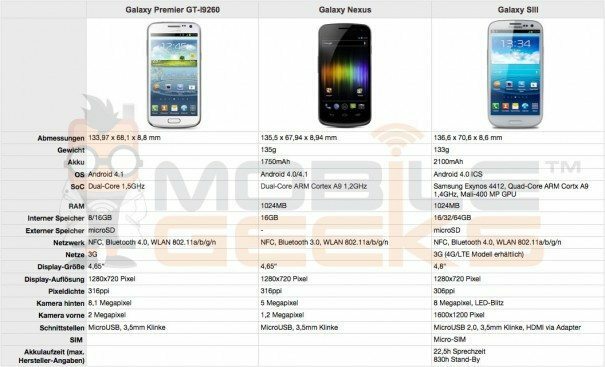 The picture of the Samsung Galaxy Premier Gt-i9260 along with a few more specifications comes our way courtesy of Ubergizmo and by way of German site Mobile Geeks, and shows that the new Galaxy handset looks to be styled on the Samsung Galaxy S3 with a little alteration to the shape. Some specifications were previously leaked in a User Agent Profile, but now we have some more that let us know that the Galaxy Premier should come sporting a a 4.65-inch Super AMOLED touch screen with 1280 x 720 pixel, along with an 8.1 megapixel rear facing auto-focus camera with LED flash, and a 2 megapixel front facing snapper. The GT-i9260 also sports the previously leaked 1.5GHz dual core ARM Cortex A9 processor, whilst coming with either 8GB or 16GB internal storage, but there is a microSD slot for expansion. The device will also sport 802.11a/b/g/n WiFi, Bluetooth 4.0, HFC, HSPA connectivity, a 3.5mm jack, and is said to be running Android Jelly Bean out of the box, and measures 133.97 x 68.1mm x 8.8mm. As for when the Samsung Galaxy Premier GT-i9260 is likely to make an appearance in the mobile space, word is sometime in the fourth quarter of 2012, and as for pricing, the word is the Android smartphone will command a price tag of somewhere around â‚¬480. So there you go, that’s the latest on the supposed Samsung Galaxy Nexus 2, and we’d like to know if any of our readers are waiting for this handset to become available, so feel free to let us know by dropping a line to our comments area below. The picture is deceptive, a Nexus device wouldn’t have either Touchwiz or a home button. Also, microsd on a Nexus device is possible, but unlikely. It is clearly not a Galaxy Nexus 2 on the basis of this…. This. Is obviously a. Rubbish rumour. Samsung wouldn’t release quad core note 2 followed by Google flagship a dual core with less ram. Than current generation phones. Shame on who published and wrote this little k bait trap. Er I meant crap.